Click Here to see our Scorpion Blacklight store. Here is a photo of a Paruroctonus becki from Northern Arizona. This scorpion was feeling aggressive when these pics were taken. 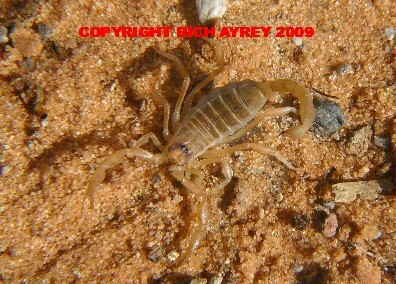 BACK to Arizona Scorpion SPECIES LIST. My name is Rich Ayrey, please e-mail me at e-mail me. Do not reproduce any photograph without the written permission of the photographer. This Flagstaff Arizona Scorpion site copyright Rich Ayrey 2008-2017. Arizona Scorpion page created 09/28/08. Arizona Scorpion page last updated 01/15/2017.